All our equipment is set up and fully tested by our own road crew and all electrical equipment is PAT tested in accordance with the statutory electrical regulations. 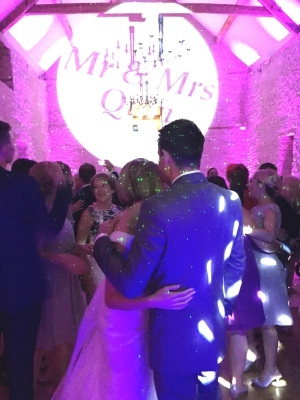 For a typical indoor wedding celebration we will provide either our White Disco Show with fabulous led columns or our Traditional show which includes a full concert style Tri-lite lighting truss that is 3 or 4 metres wide and adjustable upto 10 feet in height. (Smaller rigs can be supplied for the more intimate venue). Both shows include sound provided by the latest JBL EON system played through the latest Digital mixers and CD players and with sampling ability - simply the best in digital quality allowing us to play at any sound volume without blasting you with distorted bass !!! The lighting system is tailored to suit the venue but every rig includes true "night club" standard intelligent lighting effects from top manufacturers such as Abstract and Martin. Many of our rigs include computer controlled moving head effects, lasers and the latest LED technology providing you with truly stunning effects. This includes atmospheric LED room lighting which can be programmed to match your colour scheme. If you are a techno buff we would be happy to provide further details. PLI - Public Liability Insurance. For yours and your venues peace of mind we carry full Public Liability insurance. Please ask if you require a copy of the certificate. If you would like something a little different, just ask, we are happy to taylor our shows to your request. As well as our "Traditional" shows, you can also choose one of our Speciality Discos.